Terry Melcher's confidence must have been running high as he stepped into the studio to produce his mother. This confidence was justified by the quality of the records he had produced. However, considering the emotional baggage involved, to say nothing of taking over the musical direction of one of the 20th Century's most iconic figures, his task could not have been easy. After a car accident curtailed Doris's dancing ambitions, she began singing lessons. Heard on a local radio station it wasn't long before she was fronting the Les Brown Band where, still only 17 years old, Doris met her future husband, Terry's father, Al Jorden. The marriage was a short one. Her first hit, "Sentimental Journey", was pressed in 1944, with her first film, "Romance on the High Seas", following 4 years later. The film included her million-selling, Academy Award-nominated song, "It's Magic". Since then, her 38 films, over 500 recordings, two major TV series, a TV Special, her love and charitable work for animals and her autobiography have kept her firmly at the heart of the public's affection. Her films and public persona have ensured that she is not just America's but the world's sweetheart, perhaps visually as important at promoting the 'Californian Dream' as the Beach Boys are musically. The full story of Karel Beer's June 15th 1981 interview with Jack is featured on Jack Nitzsche at Spectropop's On The Radio page. The conversation dealing with Ms. Day, a site exclusive, can be heard by pressing play. Al Hazan. 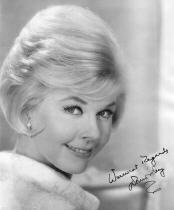 in his Early Days piece, notes his first meetings with Ms. Day: In the 1960s, probably a million guys were in love with Doris Day. I was one of them. In the beginning, I would really feel shy when I was in Terry's mom's presence. Each time I went over to their house I would walk past her quickly and go into their den, where Terry and I would practice my songs. Eventually, however, I got over my shyness with his mother and felt very comfortable being with her when the occasion arose. Jack also seemed to enjoy working with her, in his seemingly unpublished interview with Sylvie Simmons (found on this site at Magazines...Nitzsche On The Rack), Jack said: She [Doris Day] was great though. She said she wished she could sing like Ray Charles! Karel Beer's interview with Jack is one of the most interesting. The recordings "Move Over Darling", "Let The Little Girl Limbo" and "Send Me No Flowers" are discussed along with Marty Melcher's reaction to the tracks. The first fruit of the Melcher-Nitzsche-Day collaborations was "Move Over Darling". It was recorded on August 30th, 1963 at Columbia's studio at 6121 Sunset Boulevard, Hollywood, California. The distinguished cast comprised Glen Campbell, Bill Pitman, Ray Pohlman, Billy Strange and Tommy Tedesco on guitars; Jimmy Bond on bass; Gene Estes and Jesse Sailes on drums; Don Randi and Al DeLory on piano and Steve Douglas on saxophone. Add to this a string orchestra of ten violins, four violas and four cellos. A beautiful intro, surely Jack's artistry, sets up the mood. With the girly backing singers egging her on, there's no need to ask again, Doris, I'm yours! Terry produced and co-wrote; his claim that he substantially altered what was an already finished song is borne out by listening to other Joe Lubin compositions for Ms. Day. The flip, "Twinkle Lullaby", was solely written by Joe and recorded at the same four-hour session. It's very pretty, but it pales in comparison to the A-side which, deservedly, got most of the attention. In the US, despite charting, it never achieved anything like the same impact - a pity, not only for this record, but also for Doris Day's future recording direction. 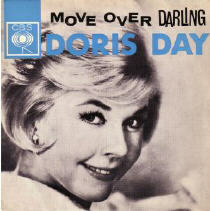 "Move Over Darling" was a very big hit in the UK and is one of those records that is still loved and played on the radio today. If "Move Over Darling" had hit big in the US, Marty Melcher would probably have reconsidered his veto of Doris Day's pop recordings. Recorded four months before "Move Over Darling", Mann and Weil's up-tempo "Let The Little Girl Limbo" enlisted a lot of interest due to Jack's mention of the recording in his interview with BOMP! Three versions of the song were cut but not heard until Doris Day's Bear Family boxed set was released in 2000. 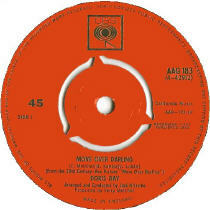 The original session, arranged by Jack, featured Ms. Day's vocal, single and double tracked. The following session, recorded a week later, featured half of the musicians from the first with a different arranger, Robert Mersey. It's good fun in all its varieties and the sort of track that could well have been a hit. One cut that is still in the can and apparently lost is the original version of "Send Me No Flowers". The song's writers, Bacharach and David, asked Jack to arrange the track in a 'white Ronettes' style. (Do listen to the interview above for the full story.) This was from the last session Jack recorded with Doris in May '64. The other track from the date, "Rainbow's End", is another goodie with an interesting arrangement. Terry was now completing his musical education, writing, singing, producing and arranging. He had built an excellent working relationship with his pal Bruce Johnson and he had just leapt at an offer from Bobby Darin to work for his new acquisition, T. M. Music (previously known as Trinity Music). The Byrds and Paul Revere & The Raiders were just around the corner - the future was bright, and the future was Terry's. As for Jack, he was one of the busiest men in rock'n'roll. For most people, the punishing schedule involved in arranging Phil Spector's hits may have been enough, but Nitzsche could never be accused of a low work ethic. At Reprise Records, as Jimmy Bowen's right-hand man, Jack arranged, produced, wrote and even had hit records under his own name. For almost all the West Coast labels he was in constant demand with independent deals by the score. Jackie DeShannon's success owed a lot to Nitzsche's work behind the scenes. Before Terry hitched up with Bobby Darin, Jack had already arranged recordings by and for Bobby, including one of my favourite Darin tracks, "Not For Me". As well as all this, he was getting down and bluesy with the Rolling Stones and encouraging a young Canadian songwriter, Neil Young. With Jack and Terry's busy schedules, it was proving increasingly hard for them to find time to share a studio. According to music-scribe Barney Hoskins in his book "Waiting For The Sun" (Viking, 1996), Terry wanted Jack to produce a version of Bob Dylan's "It's All Over Now, Baby Blue" for the Byrds. Apparently this was one cause of the 'musical differences' between Terry, the band and its management. The recording never happened. However Terry and Jack did get together for one more session. In mid-'66 the buzz at the Troubadour was about Pamela Polland (5'3" tall, has green eyes and light brown hair). Many thought she possessed a charisma and talent that was greater than Linda Ronstadt's. 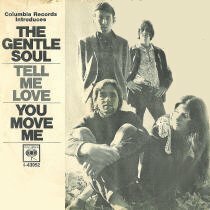 Linking up with Rick Stanley (5'10" tall, has brown eyes and brown hair; co-songwriter, vocalist and lead guitar), Riley Wyldflower (6'4" tall, has hazel eyes and brown hair; rhythm guitar) and Sandy Konikoff (Of undetermined height with brown eyes and black hair; drums), Gentle Soul was formed. Terry and Jack had them in the studio along with Ry Cooder, Larry Knechtel, Jerry Cole and Hal Blaine. Jack arranged one track, the a-side of the group's debut 45, the Rick Stanley composed "Tell Me Love". It's OK - baroque-tinged, harmony pop with a hard edge. A self-titled album for Columbia's subsidiary, Epic, followed, also produced by Melcher, but the group's early potential did not translate into chart action. Sundazed recently issued a critically acclaimed collection of all their CBS recordings, including an alternate take of "Tell Me Love", which is more ethereal and softer than the 45. Terry Melcher and Jack Nitzsche may not have recorded together again*1, but they remained friends and kept in touch. When Terry was going through his difficult period, Jack was there for him. At Terry's suggestion they even tried writing together, but Terry wasn't really in the right frame of mind. It's very sad to think we won't hear any new music from these two underrated alchemists of West Coast pop 'n' rock. However, the names Terry Melcher and Jack Nitzsche, despite usually being found in the small print, together and separately created music on a grand scale that will endure forever. *1Actually it appears they did. The exhaustive sleeve notes by Ed Osborne to a 3 CD collection from Collectors Choice Music "Paul Revere & The Raiders featuring Mark Lindsay - The Complete Columbia Singles" reveal that Jack Nitzsche scored the horns on "Ups And Downs". Quite likely the pair worked on other cuts. Q: Who was the first member of Bruce & Terry to have their name sharing a record label with Doris Day? A: Bruce Johnston. He co-wrote "Falling" with Don Wyatt, released on a Doris Day 45rpm in 1962.